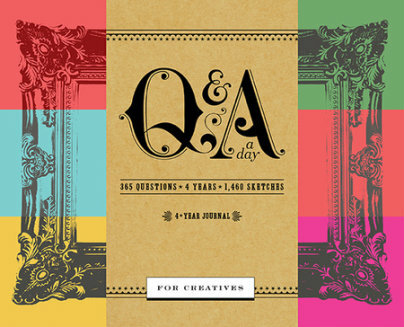 Q&A a Day for Creatives is your go-to source for inspiration, whimsy, and idea generation. Each page of this four-year journal features a compelling question designed to get you thinking drawing, and dreaming. Open the journal to today's date and fill in the appropriate space as you see fit. (Pencil doodles? Watercolor? Musical scales?) As the journal fills year after year, you'll own a showcase of your ever-growing creative output. Awhile back I got the smaller Q&A 5 year journal for my 11 yr old daughter. This time I have the "Q&A a Day for Creatives". I love that it's bigger, approx 3 1/4" x 3 1/2" in size. With this book you get 365 questions - 4 years - 1,460 sketches. I am absolutely love this sketch book and recommend this for anyone with an interest in growing your creativity, putting it on paper and watching it evolve over 4 years. This book is going to be a gift for someone, and I can't wait until she sees it! I hope she loves it as much as I have enjoyed looking through it.